Join us for our annual Hallowe’en extravaganza to experience the spookier side of history! Kids and their grown-ups imagine the past through Victorian-era fortune-telling, creepy crafts, Gilded Age ghost stories and of course, lots of candy. 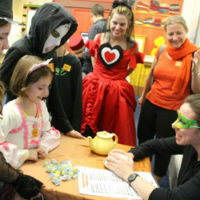 Bring the whole family for a ghoulishly good time at DiMenna Children’s History Museum—plus, as an exciting treat this year, families will also receive timed tickets to visit Harry Potter: A History of Magic during the party!